I'm back to weekly blogging after a few odd life imposed detours. Next week I'm off to sunny Palo Alto for my 20th college reunion. I whatsapped a friend saying "Looking forward to seeing some old faces". He quipped - "20 years later -we have old faces!". 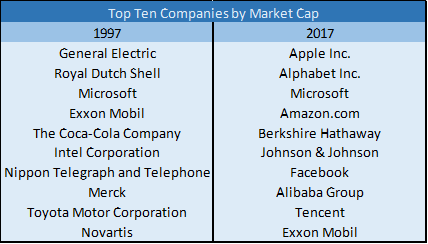 I still feel like I'm just out of college but its worth looking at what the top 10 world companies by market cap were in 1997 versus 2017. In 1997 Amazon was just three years old. Google (Alphabet) was yet to founded (1998). Facebook was only started in 2004! This was the year Steve Jobs returned to revive Apple. Berkshire Hathaway was out of favour as old fashioned. Only 2 companies (Microsoft & Exxon Mobil) stayed in the top ten. Tech companies have surged ahead to dominate the 2017 list, but in 1997 we were still 3 years away from the dot com crash and it would have been hard to guess where tech was going. No one had heard of "social media"! Thanks for joining me down memory lane.